Fast just became faster. This engine, in its latest incarnation, pumps out an arm wrenching 177 hp while its torque figures reach for the sky between 6,750 rpm (140 Nm) and 7,000 rpm (141 Nm). So it’s stronger than ever, but we made it run smoother than ever as well thanks to overhauled resonator chambers. All in all, weighing in at around 62 kg, the extremely slim 4-valve unit is one of the lightest big twins in the world. Another reason for the outstanding performance of the 1290 SUPER DUKE R 75° V-twin are the state-of-the-art, machined titanium inlet valves with chromium nitride PVD coating. Their flat design combined with the smaller combustion chamber now offer an increased compression ratio of 13,6:1. Interesting fact: The titanium valves only weigh 39 grams each, which is 19 grams less than the steel inlet valves we used before. 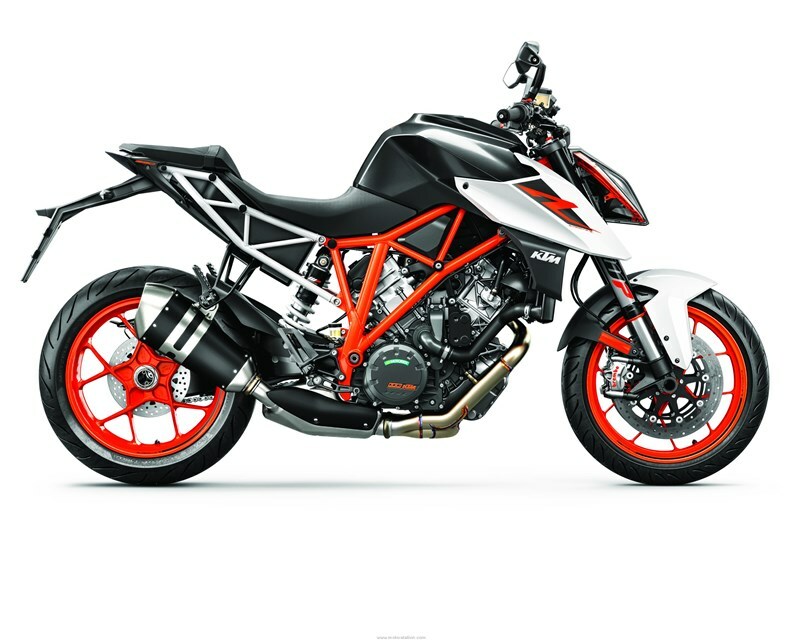 The KTM 1290 SUPER DUKE R’s new exhaust system is made entirely from rustproof stainless steel and is Euro 4 homologated. Hundreds of test bench runs and complex simulations ensured that the exhaust system, which uses a new exhaust flap, contributes decisively to the extremely smooth torque curve and excellent emission values of this powerful V-twin. And did we mention the sound? While it whispers at low revs, it will take your breath away reaching for the high notes. Instead of the electronic injection system's throttle valves being controlled by cables, ride by wire generally processes throttle twist grip movements with the help of electronic sensors and activates the throttle valves accordingly using servo motors. However, our ride by wire on the KTM 1290 SUPER DUKE R goes the extra mile: It electronically translates the throttle commands of the rider into the best throttle valve positions for the current riding situation. Choking, jolting and involuntary wheelies are a thing of the past. Voluntary ones, however, could easily be a thing of your future. The twin-plug ignition system controls the two differently sized spark plugs in each cylinder head independently of each other in such a way that more efficient combustion and a smooth, optimally controlled ignition sequence are achieved at all times. The result: more power, better feedback, lower fuel consumption and lower emissions. And so the world is a better place. The forged piston structure on the KTM 1290 SUPER DUKE R, borrowed from Formula 1 technology, results in a high loading capacity, despite the extremely short and lightweight design. Reciprocating weight is minimized, thereby maximizing the rev-happy nature of the engine. Furthermore, the piston skirts have a state-of-the-art, hard-anodized finish. Not only does this minimize friction, it is also extremely hardwearing.